para que sean vistas con facilidad al ser expuestas han de ser tiras tipo cartel y de tamaño "pagina entera"
basta con que hagais una replica a esta. 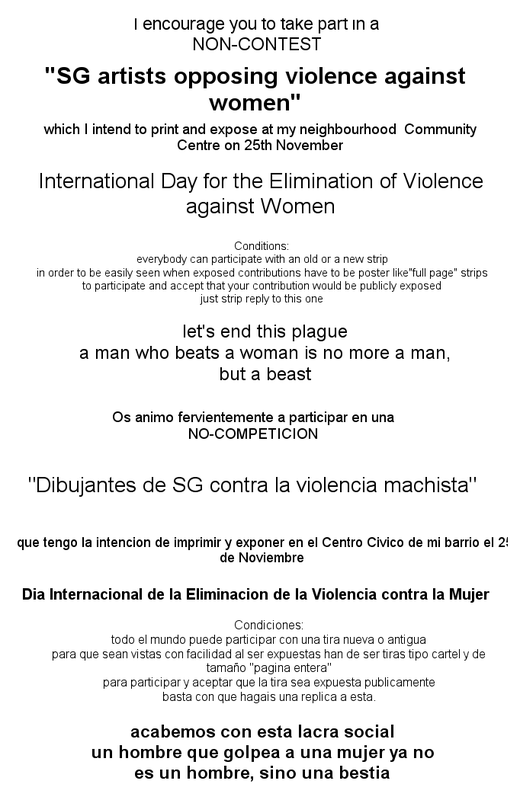 "SG artists opposing violence against women"
"Dibujantes de SG contra la violencia machista"
Anybody remembers something on this picture? Thanks again for such a GREAT idea! very great cause! if i have time tomorrow i will try to whip something up. thank you BaalMoloch, I knew you'd do it! And then we leave her flat for being a fat old mother hen. Then we complain that she's too unworldly to be our friend.